We have many great things planned to celebrate our 8th birthday in Madison! One event is The Black Earth Birthday Brick is scheduled for Saturday, April 13th. We will start and end at Fleet Feet Sports Madison. The 14 Mile Bike-2 Mile or 10 Mile Run- 14 Mile Bike starts at 8am. 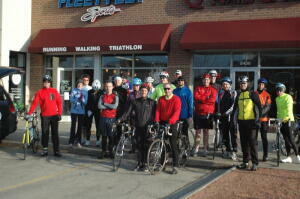 Come to Fleet Feet with your bike between 7:30am and 7:45am. Please have your run stuff packed and labeled and a Fleet Feet employee will transport your gear to Black Earth. There will be a ride leader and maps available. We encourage you to bring your friends. It will be about a 14 mile bike ride to Black Earth, then you can choose to do the 2 Mile or 10 Mile Run (cost is about $5 to run the Black Earth Race). Once you finish your run, change back into your bike gear, check your run gear back in with the Fleet Feet vehicle and ride back to Fleet Feet. It is Fleet Feet's 8th Birthday, so we will have birthday cupcakes waiting for you back at the store! RSVP to toddh@fleetfeetmadison.com if you plan to do the brick!